The Lexus brand has always symbolized luxury, power and sophistication. Their lineup of sports sedans have always delivered the goods, whether you are a driving enthusiast or just appreciate a fine automobile. For those who live in a winter climate or simply enjoy all-weather stability, Lexus even offered AWD to keep you and your vehicle on the straight and narrow. What else could make an already capable AWD IS or GS better? Well, that depends on whether or not you like living in the clouds! 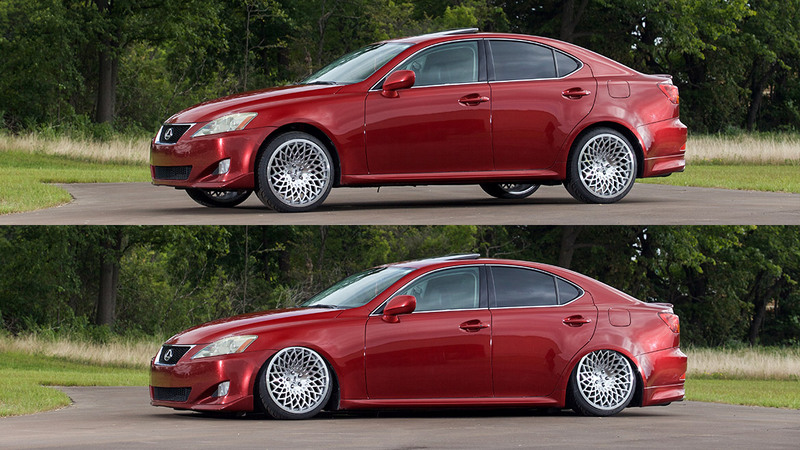 Lexus left plenty of opportunity to lower these cars and get a sleeker, meaner look. They also sculpted fender openings that can swallow some very aggressive tire sizes. 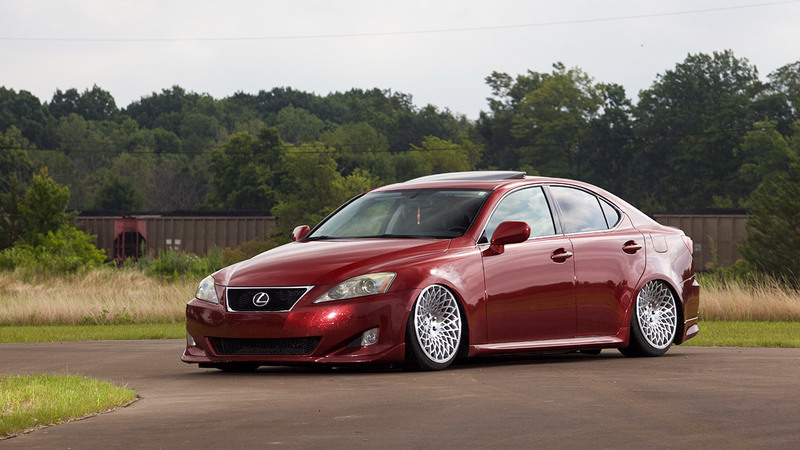 This left the engineers at Air Lift Performance a perfect canvas to work their magic toward creating the Lexus you have always wanted. Getting this whip slammed as far to the ground as possible was the first order of business. Let’s just say that our engineers achieved that goal with a 4.2” drop from stock in front and a staggering 6” drop from stock out back! No coilover system can even come close to transforming the appearance of your car like our air springs do! The best part is that you don’t need to live with all of the compromises of a static suspension. With the push of a button, you can raise back up to stock height in order to clear speed bumps or any other road obstacles. How’s that for versatility? In case you think that adding air suspension will somehow reduce your handling capability or create a bouncy ride, fear not! All of our kits are pushed to the limit to ensure precise handling and tuned to provide a comfortable, sporty ride right out of the box. If you have other ideas of what you want, there is plenty of adjustment available with our damping adjustable shocks and threaded lower shock mounts so you can set up the suspension exactly to your liking. All of this goodness is a result of using only the finest components to create our kits. The front suspension starts with our 30-way damping adjustable monotube shocks specifically tuned to bring out the best in your Lex, staying cool when running hard. As mentioned above, these shocks have a huge range of adjustment from race car stiff to comfy boulevard cruiser. We then add our own progressive rate, double-bellow air springs over the shocks and top them off with T-6061 aluminum upper mounts that contain high quality spherical bearings, giving the shocks immediate input for the best control. The recipe for the rear suspension looks very similar. Again, we used our tuned, monotube, 30-way adjustable shocks, then put our double-bellow air springs over them. This time, the units are inverted to provide proper clearance and industry-leading suspension travel. This innovative package helps maximize performance while maintaining the excellent ride quality found in the Lexus’ DNA. While overall performance is always important, we didn’t forget about durability. In order to bring the most durable air suspension possible to market, we tortured the main components of this kit to 1 million cycles (equivalent to approximately 100,000 miles) on our hydraulic test rig at temperatures ranging from -30°F to 150°F. Combining this test lab work with on-road testing and our one-year manufacturer’s warranty, your suspension can handle whatever the road throws down. Worried about installation complexity? If you can wire a stereo and install suspension components, then you have the necessary skills to complete the job on your own. And if you have questions or get stuck, you can rely on our highly regarded customer service squad to get you sorted quickly. 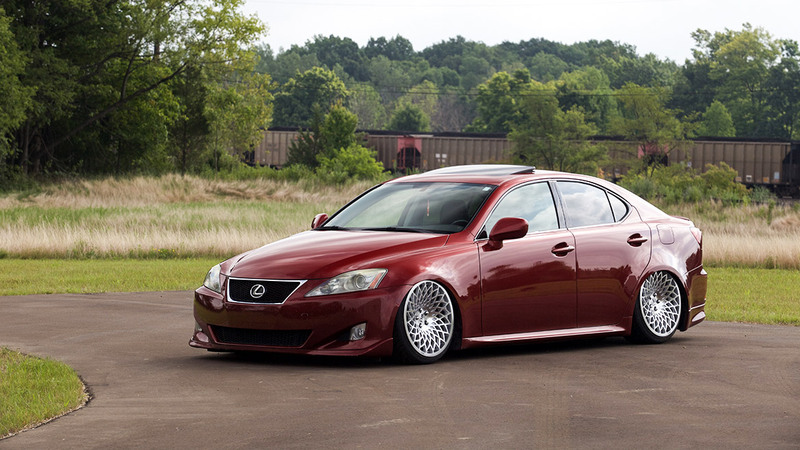 If you are looking for the most versatile, highest quality, lowest dropping suspension available for your Lexus, then find yourself a dealer, score a suspension kit, along with one of our many air management systems, and start living your #lifeonair.